LEDGlow's Golf Cart Voltage Reducer will allow you to safely install and power any 12v LED lighting accessory from your high voltage golf cart battery with ease. LEDGlow's Golf Cart Voltage Reducer will allow you to safely install and power any 12v LED lighting accessory to your electric golf cart with ease. This voltage step down converter can be installed to any 15v to 60v golf cart battery with the included input and output power wires that will be installed directly to the battery (input wires) and the LED light kit (output wires). It is imperative that this golf cart voltage reducer is installed to a flat, metal surface as the converter may reach high temperatures and should not be mounted to any plastic material of the golf cart. 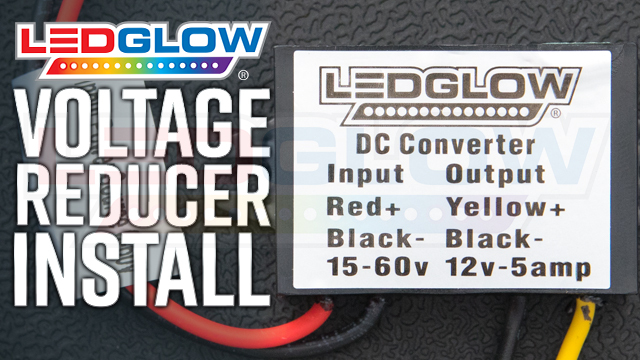 This voltage step down converter will safely power any LEDGlow lighting kit as well as any accessory up to 5amps. LEDGlow includes all necessary installation instructions, free lifetime technical support and a one year limited warranty with each voltage reducer for golf carts purchased.